Growing a brand’s sales by reaching a new audience does not always require the launch of any new products. 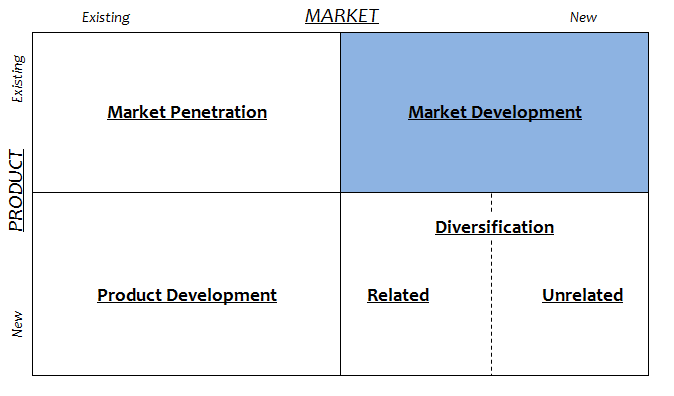 Instead, Ansoff’s “market development” strategy involves finding new groups of buyers as potential customers for existing products and services. A recent example of this comes from Quorn, the leading meat substitute product in the UK and Ireland – which has invested more than £100m in developing imitations for everything from chicken nuggets to minced beef using the fungal ingredient, mycoprotein. Unsurprisingly with its taste and texture of meat, the majority of Quorn’s custom has traditionally come from vegetarians and therefore a “veggie-food” image has been created. However, when horsemeat was found in numerous ready meals and frozen foods during the 2013 horsemeat scandal, Quorn saw for itself the brand’s potential in non-vegetarian markets. It’s 13% revenue growth last year stemmed from the acquisition of two million new customers and resulted in carnivores outnumbering vegetarian buyers for the first time in Quorn’s history. Even a year after the scandal, consumers’ trust in meat suppliers does not appear to be returning, with a recent YouGov survey finding that 21% of people are still eating less meat than a year ago – which has created an opportunity for Quorn to exercise the market development strategy to further grow revenue and profit. CEO, Kevin Brennan, himself stated that the 2014 agenda for Quorn is focused on growth. As marketers, we are well aware that consumers do not buy products or services – they actually buy benefits. In the case of capitalising on reduced meat sales, the key for Quorn was to understand the product-benefit lost from reducing/removing meat from your diet: protein. By buying Quorn, sceptical meat-eating consumers could once again gain the protein product-benefit of meat, without the uncertainty over its ingredients. Combined with the lower saturated fat content of mycoprotein when compared to meat, this naturally lends the brand to the ‘active consumer’ psychographic who seek a “healthy protein”. Now that the market segment worth pursuing had been identified, what’s crucial to successful market development is a strong promotional strategy, since there’s no new product launch to raise awareness amongst the new audience and penetrate the market. This would not have been feasible for a major UK brand that had an annual advertising budget of £500,000 up until 2014; hence why Brennan took the decision to hike the annual spend to £5m as of this year. To emphasise the protein-benefit of its products, Quorn decided upon the use of a celebrity endorsement through Olympic gold medallist Mo Farah, making him the first sportsperson to represent the brand in more than two decades. For a full understanding of how celebrity endorsements change consumers’ perceptions of a brand and the theory behind it, check out my article on Subway’s use of celebs in their TV ads. Throughout the campaign, as you’ll have noticed in the above advert, there’s no explicit mention of Quorn being a meat substitute, just a “healthy protein source because it’s low in saturated fat” – playing perfectly towards its identified market of active consumers who seek a healthy protein, whilst in no way jeopardising the views its existing vegetarian customers. With growth opportunity becoming increasingly limited in meat alternative industry, this market development strategy has opened a new door. The next few years could be an exciting time for Quorn. International marketing director, Peter Harrison, believes the meat-alternative category will be worth £600m by 2020, and with Quorn carrying a strong and positive message that resonates with an attractive segment of carnivores as well as vegetarians, what Brennan describes as Quorn’s “growing mode” could be set to continue for some years yet. This entry was posted in Marketing Mix and tagged Ansoff Matrix, Celebrity Endorsement, Market Development, Mo Farah, Promotion, Quorn, Segmentation. Bookmark the permalink.